Disaster has come to the land as the king's reign nears its end. The kingdom has fallen into disrepair. To ensure continued peace, the king must choose a successor among his sons. With a single hopeful decree, the king announces that his sons have 3 years to rebuild the once majestic kingdom. The prince who builds the most impressive castle may yet have a chance to repair the prestige of the shattered kingdom. Using precious Action Point resources, strategically move your loyal Knights to stand atop the tallest tower. Not only must you build as high to the sky as you can, but you must also build across as much broken ground as possible to maximize the glory of your castle.As your towers rise, so too will the peoples' hope in a new era of prosperity. May you be the prince to become king. * Art from Michael Menzel! * Game design from Wolfgang Kramer & Michael Kiesling! 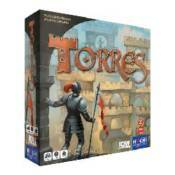 * In 2000, Torres was awarded the Game of the Year prize from the prestigious Spiel des Jahres: the highest honor a boardgame can receive.